Every man, wherever he goes, is encompassed by a cloud of comforting convictions, which move with him like flies on a summer day. I do not think that the real reason why people accept religion is anything to do with argumentation. They accept religion on emotional grounds. One is often told that it is a very wrong thing to attack religion, because religion makes men virtuous. So I am told; I have not noticed it. Many people would sooner die than think. In fact they do. Philosophers, for the most part, are constitutionally timid, and dislike the unexpected. Few of them would be genuinely happy as pirates or burglars. Accordingly they invent systems which make the future calculable, at least in its main outlines. A stupid man's report of what a clever man says is never accurate because he unconsciously translates what he hears into something he can understand. What a man believes upon grossly insufficient evidence is an index into his desires -- desires of which he himself is often unconscious. If a man is offered a fact which goes against his instincts, he will scrutinize it closely, and unless the evidence is overwhelming, he will refuse to believe it. If, on the other hand, he is offered something which affords a reason for acting in accordance to his instincts, he will accept it even on the slightest evidence. The origin of myths is explained in this way. The puritanism of Christianity has played havoc with the moderation that an enlightened and tolerant critical spirit would have produced. I've noticed that in whatever country, county, town, or other region there is a regulation enjoining temperance, the population seems to be entirely composed of teetotallers and drunkards. There's a Bible on that shelf there. But I keep it next to Voltaire - poison and antidote. Boredom is a vital problem for the moralist, since at least half the sins of mankind are caused by the fear of it. To teach how to live with uncertainty, yet without being paralyzed by hesitation, is perhaps the chief thing that philosophy can do. Patriots always talk of dying for their country but never of killing for their country. We have, in fact, two kinds of morality side by side: one which we preach but do not practice, and another which we practice but seldom preach. Government can easily exist without laws, but law cannot exist without government. I've made an odd discovery. Every time I talk to a savant I feel quite sure that happiness is no longer a possibility. Yet when I talk with my gardener, I'm convinced of the opposite. Nothing says, 'I have no idea what to get you,' quite like giant beige bath towels. Too little liberty brings stagnation and too much brings chaos. 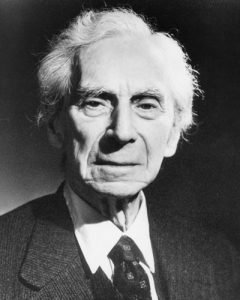 47 quotes by Bertrand Russell.